We all want to be a part of compelling creative projects—projects that solve business problems and engage users through meaningful and valuable experiences. However, given tight budgets and timelines it's challenging to create genuinely innovative design, identify gaps in the process, and consider the variety of factors for effective user experience. To solve these common challenges, I researched existing user experience models or frameworks and found that most UX diagrams are confusing, unorganized, complex, or antiquated, making them useless for designers and clients. That’s why I decided to create my own model. "I invented nothing new. I simply assembled the discoveries of other men behind whom were centuries of work… Progress happens when all the factors that make for it are ready and then it is inevitable." This was exactly my approach. I began my work by reverse-engineering hundreds of award-winning interactive projects* from a range of industries and project types (marketing websites, games, apps, e-commerce, educational, etc. ), to understand and document the concepts, interactions, and elements of the experiences. Graphic used with permission from TheFWA.com (Favourite Website Awards). Research included reviewing Google’s Creative Sandbox, Communication Arts, The FWA, and Behance from January-June 2014. It was impossible for me to determine if each project was successful or not—effective design requires more than a pretty surface or whiz-bang interactions. However, the research did help provide insights on the different components that comprised each project. As a result of my research, I determined most projects had a strong balance of content and interactions. The content was engaging and easy to consume, while the interactions supported access to more content. When considering the intersections on the diagram, there was the Process by which users navigate through content through the provided interactions, which includes communications, reactions, actions and transactions. Another set of intersections was Experience Factors (★). In order to have an effective experience a product needs to be comprehensive, useful, usable and branded. Creativity: Creative experiences have the potential to engage users and provide more unique brand experiences. The model provides a framework for presenting content more creatively, through use of a variety of techniques and methodologies. Communication: When terminology and language are common between designers and clients, it provides for greater communication and helps keep the strategy on-track. Simplification: The terminology and practices that are a part of experience design can be vast and confusing. This model simplifies the complex design process, and delivers it in consumable bite-sized chunks, by outlining all the considerations that must be made throughout a project. Collaboration: When we understand the factors involved with designing experiences we then understand the different roles, teams, assets, and content required to execute on any given strategy. This understanding can help create a project plan and make it easier to delegate tasks. Gaps: The model can help identify gaps within the design process. For example, a business may have established requirements, goals, and functionality for their marketing site, but maybe they haven’t developed a content strategy—or they have only marketing research, but haven’t performed formal user research. There are five layers to consider when incorporating content—Content Types, Models, Treatments, Methods, and Architecture. Content Types: Content is more than just text. Content includes a variety of media including photography, video, audio, data, documents, and a whole bunch of other things you might not have even considered. When content types are combined there are more opportunities for creative forms of media. For example, infographics combine text, data visualization, and illustration. It's also critical to inventory the different types of content and how the content can become object-oriented, which is when content is used in other contexts. Content Models: Content models combine the different content types into a more recognizable model or format. For example, a recipe is a content model, which may include content types such as ingredients, instructions, and photography. The content model for a movie review may contain content types such as a movie description, ratings data, a list of actors, and a movie trailer. Content Treatments: Content can also have applied aesthetics and treatments. For example, the visual style may include 2D illustration or the photography may be treated with a vintage style or duotone. Text may have a unique tone or personality based on the brand voice. Graphics may reflect a certain company culture or personality, which can be indicated in brand guidelines. Content Methods: Content can be presented in more creative ways. It can be vastly more interesting and engaging when methods like storytelling, metaphors, analogy, symbolism, scenarios, challenges, or other creative concepts are applied. Content Architecture: Content architecture is the structure and organization of information in a website or software system. It touches all content categories including content types and models and how content interlinks. To summarize, Content Types are aggregated to create Content Models. The content types and models can have an applied Content Treatment. A Content Method can provide a narrative or framework for the content. All of these elements are organized through Content Architecture. There are five layers to consider when incorporating user goals: User Types, Needs, Motivations, Behaviors, and Outcomes. User Types: It’s important to understand the different user types that will use the end product. A common practice is to create user personas that detail their different roles, responsibilities, skill-levels, demographics (gender, age range, languages, locations, etc.) psychographics (personality, values, attitudes, interests, lifestyles) and where, when and how they will use the product. Needs: Once user types are identified, it is critical to understand and define the relevant needs and aspirations that will help fulfill their goals. Some needs may be more simple, like finding documentation, while others are more complex more physiological or esteem needs. Additional examples of needs may include personal progression, accomplishment, mastery, recognition, status, belonging, expression, or a sense of purpose. Motivations: Once the user needs are identified, we need to understand how users are motivated to fulfill those needs. This could be a wide range of intrinsic or extrinsic rewards or motivators, implemented with cues, design triggers, or other techniques. Behaviors: Once the motivations are understood, it's important to research the user's current behaviors and how new motivations can potentially drive behavior change. With enough motivation and behavior change there is a greater likelihood of developing new habits and loyalty to a product and brand. Outcomes: The combination of Needs, Motivations, and Behaviors can then translate into meaningful and measurable outcomes for users. To summarize, each User Type has a set of Needs they are trying to fulfill. Users are Motivated to take action. Repeated Behaviors can produce significant user Outcomes. An example may be mother with a busy schedule (User Type) who Needs to train for a 10k. She might be Motivated by daily reminders and encouragement from friends to exercise (Behaviors) resulting in longer distance runs (Outcome). There are four layers to consider when incorporating business goals—Operations, Offerings, Outcomes, and Mission. Operations: Each project has operations that support the product, which can include people, resources, and other connected experiences. People involved in the project can be key business stakeholders, content contributors, subject matter experts, collaborators, administrators, recruited users and others involved in the project. Resources may include content data feeds, APIs, third-party tools, stock artwork, brand guidelines, existing user research, analytics or other resources. Connected Experiences can happen prior, during and after the experience. First, understand how users will find the product either through internal communications, advertising, the App Store, search engines or through social media. This helps make the communications consistent, congruent, professional, and focused. Then users may interact with departments like live customer support, technical support, human resources, or others. This understanding informs the designer how the company has the capacity to support user inquiries. Offerings: The business may offer an ecosystem of products and/or services. It’s also important to understand how these products and services relate to each other. To communicate these offerings, the business should also have a value proposition, which states why a consumer should use the product or service versus other competitors. Outcomes: The offerings ultimately support meaningful metrics and Key Performance Indicators that help support business success. KPIs may include financial performance, customer acquisition goals, increased customer satisfaction, employee performance metrics, call center metrics, or other indicators. Mission: A mission statement provides the core purpose of an organization, its competitive advantages, its target audience, and the reason the organization exists. The mission statement should guide decisions and clearly define goals. To summarize, the Operations support the business Offerings. If customers have positive brand experiences and transactions they provide business Outcomes, which help fulfill the business Mission. There are four layers to consider when incorporating interaction—Patterns, Systems, Devices, and Humans. Pattern Interaction: Design patterns (AKA Micro Interactions) are reusable components and interactions. Patterns include everything from headers and menus to calendars and maps. Resource libraries for patterns include Pattern Tap, Mobile Patterns, and pttrns. System Interaction: The system can contain navigation, flows, feedback, and notifications to help the user progress and achieve their goals. The nature of the system can either be static, meaning that it is unchanged or dynamic meaning there is constant change or activity within the system. Dynamic systems can be regulated or self-regulated, meaning there are varying degrees of permissions and actions certain users perform based on their credentials. Systems can also be defined by the content management system or other system software, which may have a set of capabilities and limitations. Device Interaction: When designing for an experience it’s key to understand the capabilities and constraints of the targeted devices, including screen sizes, connectivity, user interface conventions and other factors. The experience could happen with a variety of devices including phones, tablets, kiosks, terminals, watches, appliances or other things. For example, modern phones can support gestures, geolocation, accelerometers, audio recording, camera capabilities, push notifications and other features that are native to modern phones. User interface design considerations are also made to provide experiences that are ergonomic and comfortable when using certain devices. Human Interaction: The human interaction may be formal or informal, personal or interpersonal, social, or some other type of human interaction. To summarize, a set of Patterns are provided in a System. The system can be available on multiple Devices to encourage certain types of Human Interaction. Effective user experience is more than just the simple usability of a product. When creating the CUBI model, I concluded that there are at least four primary factors for effective experiences. ★Branded Experience: A brand experience is not simply the visual identity. It’s the tonality and totality of the entire brand experience for a customer at any touchpoint. Any experience a user has with the business is a brand experience, whether it’s reviewing product information online, receiving live support from a call center, opening product packaging, or learning about the product or service from friends. The brand experience should convey to users that it’s credible, reliable, reputable, and that the company delivers on their promises. Brand communications and transactions can make or break brand loyalty. ★Comprehensive Experience: A comprehensive experience is one that is both comprehendible and extensive. A comprehensible experience is understandable, clear, uncluttered, properly labeled, scannable, organized, categorized, and lacks ambiguity. If there is an inordinate amount of corporate lingo, jargon, slang, or the messaging is not relatable, the experience may not resonate with users. An extensive experience provides users with a sense of completeness. Missing content can leave users unfulfilled. For example, if users don’t have enough information about company offerings on a homepage or within supporting pages, people may leave the site or delete the app. ★Useful Experience: A useful experience satisfies user needs, makes them feel empowered or productive, and helps them efficiently achieve their end goals. This can be measured by their changes in behaviors, actions, and performance or by other tangible means. ★Usable Experience: A usable experience is easy to use, intuitive, findable, learnable, legible, consistent, and provides prompts and feedback to communicate their progress in a system or process. When businesses provide systems for users to interact with, there are typically four process steps to consider. Communications: The intersection between business goals and content is communications. The branded content communicates comprehensive messaging to engage users. Reactions: Users react to these communications and quickly decide if it’s something useful to them. Actions: The reaction can motivate users to take action to fulfill a goal or perform a task. This could be prompted from a call to action, trigger, task list, dashboard or by other means. Transactions: User actions then translate into business transactions. The types of transactions may include purchases, providing ratings on products or services, customer loyalty registration, etc. Once the CUBI Model was developed, I made the observation that user experience disciplines, tasks, and methods matched with the major components on the model forming a structured outer ring. This ring helps indicate the potential tasks and efforts required to execute on the strategy. It doesn’t have to be daunting or disorderly. 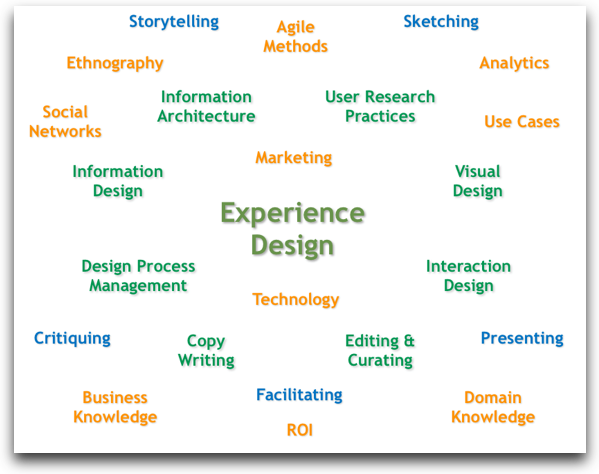 Please note that there are too many user experience disciplines and tasks to incorporate on this diagram. For example, content development can potentially require content strategy, subject matter expertise, and information architecture. To identify user goals it may require user research methods such as surveys, contextual inquiry, interviews, and usability testing. After months of research, peer reviews and study, I hope designers, developers, and clients will find this an invaluable framework for projects to help determine product viability and feasibility. Whether it's a mobile game, healthcare software platform, or marketing website, engagement requires detailed strategy and effective execution. We welcome your thoughts and input on the CUBI UX Model. We also encourage you to share this article with others to get their feedback. Look for a future Nerdery webcast to further explain the model and how it can help with your project success. Click here for more information about the CUBI User Experience Model. Devised in the 1980s, the Kano Model proves itself an invaluable tool for modern research, when leveraged properly. Psychologist and cognitive scientist Dr. Susan Weinschenk explains how her science informs UX design. Corey Stern is a User Experience Designer at The Nerdery with over 15 years experience creating engaging interactive media for agency, startup, and Fortune 500 clients. His areas of expertise include user experience, strategy, user-centered design, user engagement, interactive design, web/mobile design and visual design. Corey graduated from Academy College in Minneapolis, Minnesota with an Associates Degree in Multimedia and Graphic Design. Follow Corey on Twitter. I think Corey did a great job on this article. Over the years, I've seen many van diagram with different layers of information stack on top of it—some were simple and some were overcomplicated and confusing. This approach is a happy medium that drives the right points of what it means to be a UX designer and the skills that follow through with it. In order to build a creative project we need different types of characters and innovative features in our thinking power and skills. No doubt a project success is completely depending upon different strategies and planning and therefore we need to follow different types of references; while following the complete instruction from this valuable blog post we are able to get sufficient data about a project success. With the help of these graphical instructions we are able to bring some creativity in our project structure. HI Corey, i wrote you long time ago that i was going to use your CUBI UX model for my phd thesis 'Designing Intercative Multimedia Educative Environments at Museums' where i added to your model the field of 'social group goals' which differ slightly from those user individual goals. I am working on CSCW - CSCL basis. The social component adds some complexity to the traditional HMI - HCI model. I would like to share with to share with you how i applied to my research. I am also in LinkedIn (jpgg151172@yahoo.com). I shared your model in the group i created in facebook (interaction design groups in Colombia) as IDF country manager for Colombia. Thanks, Juan for your telling me more information. Here's my contact information if you would like to share your research. I will also send you an email this morning to your Yahoo address.http://cubiux.com/contact.phpThe CUBI model does take under consideration that "human interaction may be formal or informal, personal or interpersonal, social" in the Interaction component. There are certainly times when individuals collaborate on group goals. A great example of this was the FoldIt game which required collaboration: http://en.wikipedia.org/wiki/Foldit And of course there are many more examples of collaboration, even outside of the interactive space. Hi Corey, this is an amazing representation of the processes involved. Really helps visualize the different aspects involved in an organized fashion. I really liked the images that go along. They are really helpful and well designed. I wanted to know what your opinon was on using these processes to map out what deliverables will be provided at the end of the process. I know the product itself is a deliverable. However, content inventory is a deliverable. Wireframes, prototypes, styleguide, customer journey maps. Is there a way to connect these processes to deliverables, that would be awesome. Also, would you consider applying these to small, lean products or is it more suitable for enterprise level products? You could use the "Outer Layer" in CUBI model to think about the types of deliverables that may be a part of a project. This was part of the reason why I created the model, was because I'm very involved in doing estimates for our clients. As you can see in the model, wireframes and prototypes are near the Interaction side. Journey maps are on the User Goal side. Since style guides are a part of a treatment, it would go on the Content side. If you start to have a "well-rounded" approach and consider all of these components, you will understand the tasks, effort and disciplines involved. This model does work for both enterprise and lean design. The same principles apply. Cory, this is a lovely model and very comprehensive. Well done. Well done! Your UX diagram does indeed manage to be more clear and comprehensive, compared to many others out there. It covers much of the essence of the multitude of factors that need to be considered, and the framework should be helpful in designing good experience models into future projects. Regarding the first comment on improving on strategy/product, I'd also like to see additional focus on the product process, i.e. maybe a common pattern of steps taken to implement UX throughout a product's lifecycle. Maybe akin to the Lean UX Principles, which could be incorporated into the model. Where is the strategy part? (The part where the business is transformed into a decision-making process.) Design is always a series of choices and risks, not a direct translation from stakeholders interviews to wireframes. The center should not be UX, but product. The focus should not be UX but the final product. That's the only important thing. Everything gravitates around product. UX is just a step on the trajectory towards the product. If you put UX at the center of everything, you will neglict crucial aspect of the project: strategy, visual design, technology. It's great diagram for a class on UX, but not very oriented toward the whole project or finsl product. Thank you Matthieu for your questions and comments. That's the type of constructive feedback that helps for future versions of the model. I'll try to address your questions/comments. I do agree that "design is... not a direct translation from stakeholders interviews to wireframes." Good design is not order taking from just the business. UX is much more a process. The process begins with Discovery (Understanding users and the business), then Definition (Defining the content and technology that supports the user goals and business goals) and the third phase of Design which is the implementation of the solution through a variety of UX tasks. 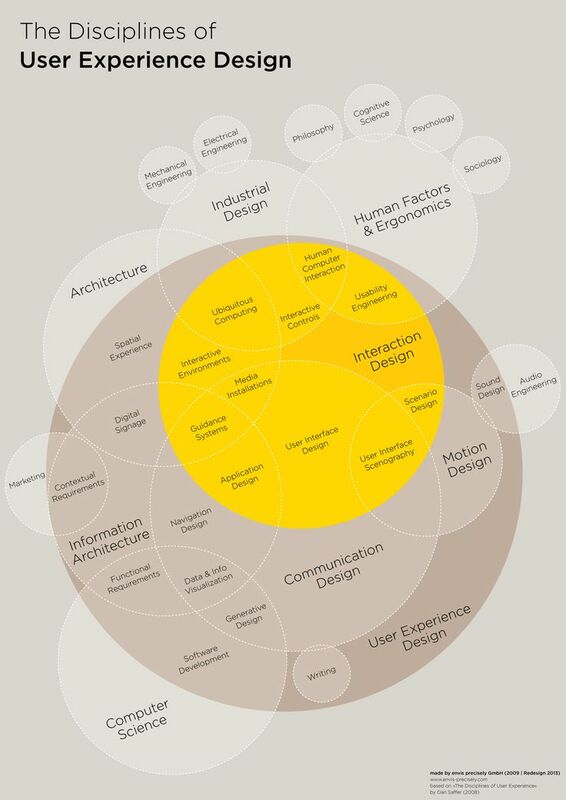 See the outer ring of the model for various UX tasks. Design is also making decisions and defending the design decisions in front of clients, and "not be their friend" as Mike Monteiro would say (http://muledesign.com/2014/09/13-ways-designers-screw-up-client-presentations). "Your decisions should revolve around achieving goals." Strategy is a part of the each of the main sections in the CUBI UX Model. For Content, a large portion of the strategy is involved in Content Strategy. For the Business, there is the Business Plan and Brand Strategy as some of the things to be addressed. For Interaction, there are technology solutions to recommend based on client goals and constraints. For Users, there are strategies for understanding users and collecting insights through prototypes and usability studies. So in short, there are many strategies to achieving project success. I think it's a fair point to state that "Product" or "Product Experience" could be at the center. This model is the release of Version 1, so this may be a good consideration for Version 2. Thank you! You made the comment "If you put UX at the center of everything, you will neglect crucial aspect of the project: strategy, visual design, technology." Visual Design is a part of the User Experience, which I address in the "Content" section under "#3 Content Treatment." This could be an aesthetic treatment on type, graphics, illustrations, button styles, etc. Technology is addressed in "Interaction" under sections "#2 System Interaction" and "#3 Device Interaction" which are both related to technology capabilities and constraints. Hopefully that answers some of your questions on the model. Thank you for reading and contributing to the discussion. Plus, valuable insight as to why. Hello Stern, Awesome way to build UX business case for enterprise. It brilliantly covers all possible aspects, challenges and solutions to all the stakeholders involved in User Experience of enterprise UX Digital Library. Eneterprise faces challenges of Information Lifecycle management and adoption CUBI framework an be game changer. Extremely helpful, researched and detailed! This is a very good and helpful work. I couldn't help noticing the extreme relation that your model have with the Golden Circle Theory that Simon Sinek presented in "Start with Why" - Summing it up, it's a book about how we normally do things starting with "What" (Example: a Website, a Interaction Totem, an Outdoor...) when we really should start with "Why" (The objective, in another words, the actual content and purpose for the final product a.k.a. "Why"). Too many companies say: "Hey, i need a website", seeking the "What" but not knowing the "Why" of it - Would really a website solve all the company problems? In the end, it's all a marketing and design problem solving. The CUBI model demands exactly that, first, at the very core of your project should be: Content - User Goals - Interaction - the Businnes Goals and the User Experience and Content absorved, never the final result. Thanks for sharing Corey! I will keep in touch for the usage in a daily basis. WOW, Corey! I really love your CUBI model. It definitely resonates with my experience of the UX world, and I will spend some time working with it. I do a lot of enterprise application business analysis & UX design, so I will spend some time thinking about the outer rings, and whether or not system functions, data design, etc. can logically be incorporated into Interaction (or need their own zone). Also - i like the counterpoint of roles/tasks across the diagram - as there are natural relationships exposed (user research / market research) by their positions on your diagram. Once again, thanks for sharing! This framework is fascinating - thanks for sharing your expertise!